This must be a very similar view as they had in 1942. Four weeks of walking through and experiencing the history of “Operation Musketoon”, has come to an end. Ronny and I have got a very humble experience of the whole story. By meeting people who really have experienced the people and the happening in real time. We have also taken all the steps through the whole route of the survivors towards Sweden. We still have to visit Sachenhausen and the memorial monument there, and will do the dive down on the submarine HNoMS UREDD with ROV. The serie is planned to be on screen in February. 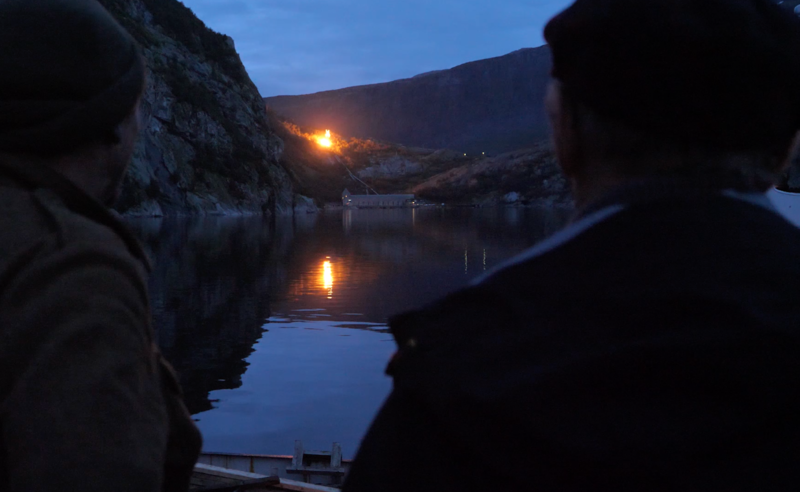 The project is a co-operation between Norwegian Forces and Norwegian Broadcasting (NRK), and with very good help from local people, Statkraft and institutions, from Bjaerangsfjorden, Glomfjord, Beiaren, Saltdalen, all the way to the Swedish border. Together with Tom Edvindsen (Norwegian Broadcasting) we have met and talked to lots of people with close connection to the history, and with a story to tell about what happened. Some film technical acting we had, but just to describe the history. The main focus have been to put light on this unknown, complex, very demanding, successful and tragic mission. However, for Ronny Bratli and me it was important, that we did the whole route from Bjærangsfjorden to Sweden in Sverre Granlunds footstep. Not copying but again put light on it´s complexity and challenges. 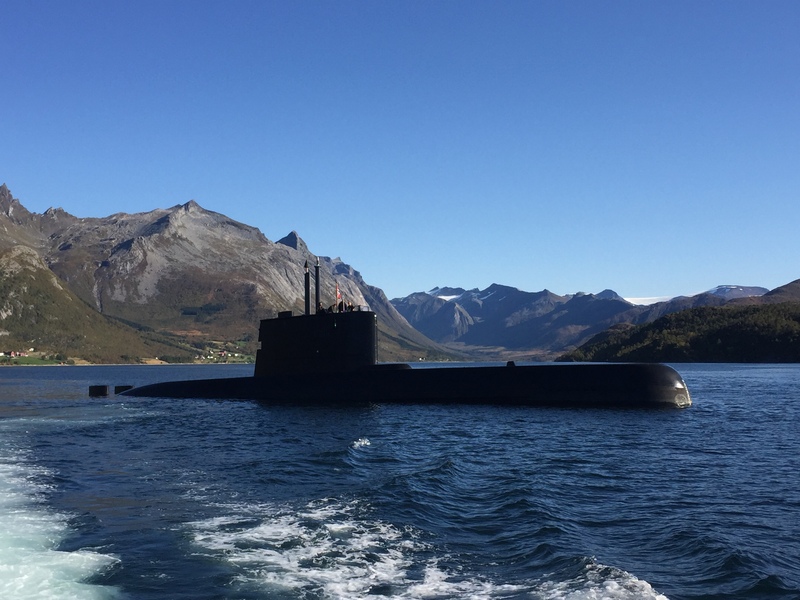 The Norwegian submarine, HNoMS UTSIRA and its crew recreated the float-off, like the French submarine JUNON did in Bjaerangsfjord 15th of September 1942. At the same position, but we did this at dawn. Started off with a float-off from the Norwegian submarine HNoMS UTSIRA in Bjærangsfjorden, as close as possible to the position submarine JUNON left the Commandos 15th September 1942. Like they did, we had three kilometers to paddle the dingy to the bottom of the fjord, with all the gear like they had in 1942. At least the weight, which was about 32 kg inclusive charges per person. Ronny walking towards Fykan and Glomfjord. Observing the Power Station and try to find a route. From Bjærangsfjorden we crossed the mountain towards Fykan and the Power Station. The route was debated, and with Granlunds and Faircloch reports, we think we could see and find the correct route to the Station. There is a marked “Sabotage Route” across the mountain which is pretty correct, but not correct. It is in a very difficult, and challenging terrain, where they must have used much time to recon forward to find the route across the mountain and down to the station. Reaching the Station we got good help from the crew at the station to show us the turbines and pipline. With the reports from the survivors we also could find the right spots to lay the charges both in the station and on the pipeline. Together with Johannes who is the last living who saw the explosions. 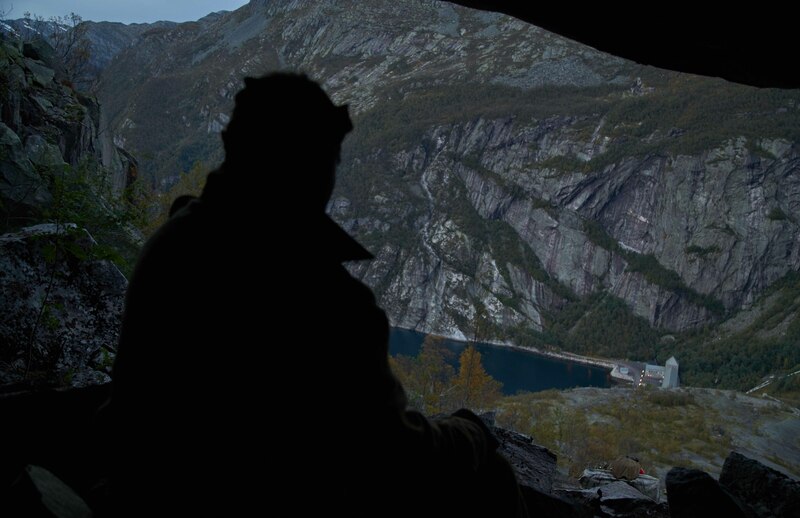 From the station we followed the rout, as we think they did, of the four survivors (O´Brian, Trigg, Fairclough and Granlund) up from the fjord to the mountain plateau North of Store Glomvann. Here the real team divided into two groups. On our way up Fykan River. Wollen clothing from top to bottom. We had decided to follow Sverre Granlunds tracks towards Sweden. The distance was about 200 km, which we used 10 days to complete, with two lay up position days. However, the situation compared with the real Musketoon team would never be possible to imagine and experience, but at least put light of the challenges. Ronny and me, wanted to try to feel a little bit how it could have been. This by using mostly the same clothing and equipment as they had, and we did the first four days or 100 km without food. This ended, as expected, in slow walking and cold night´s, but lots of blueberrys and some cloudberrys helped a lot on our energy. Tom the cameraman and producer followed us most of the time. 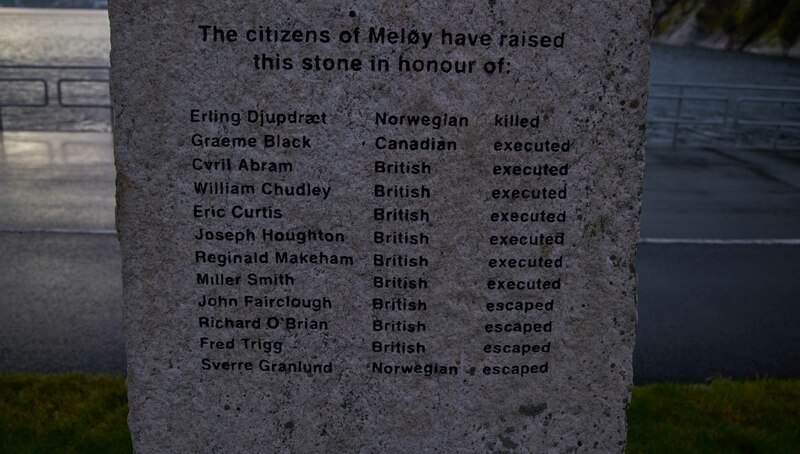 Meløy community had for a long time, not because of us, planned and prepared a great and very nice memorial day for 75th Anniversary for the operation. Lots of people participated through out the day on different arangements. We got the pleasure to experience this very nice happening. Thanks to Meløy. Memorial speeches and salute in front of the statue.